We’ve updated the Merritt UI design! 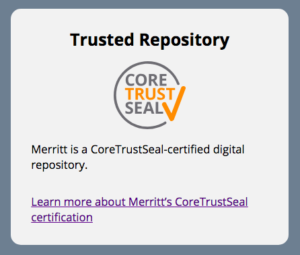 This redesign is intended to showcase our certification as a CoreTrustSeal trustworthy data repository and highlight some of the library and archival projects that entrust their preservation to Merritt. Best of all, this new design makes it easier to keep Merritt’s information up to date going forward. This is a syndicated post. Read the original at UC3 :: California Digital Library 2018-08-14.